Venezuela held nationwide armed forces exercises on Saturday, calling on civilians to join reserve units to defend against a possible attack after U.S. President Donald Trump warned that a “military option” was on the table for the crisis-hit country. 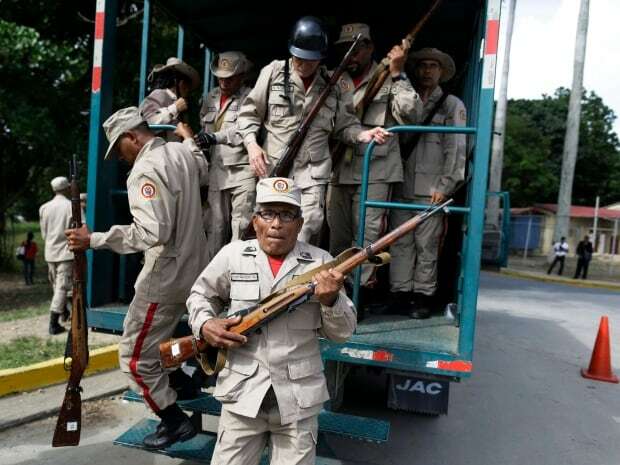 “Against the belligerent threats of the United States, all Venezuelans between the ages of 18 and 60 are required to contribute to the integral defence of the nation,” said an announcement broadcast early on Saturday on state television. Maduro used Trump’s threat to try to energize his political base, broadcasting images of rifle-carrying civilians negotiating obstacle courses and learning hand-to-hand combat. The government created the hashtag #EsHoraDeDefenderLaPatria, which translates as “It’s Time To Defend The Homeland,” to promote the exercises. 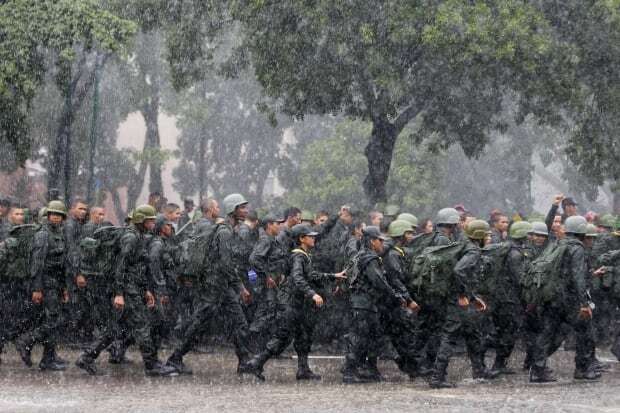 TV images showed Venezuelans young and old entering military reserve registration centres. But there was no evidence that registration reached far beyond government employees and Maduro’s Socialist Party loyalists. Scenes were aired of camouflaged sharp-shooters firing their weapons while military commanders gave fiery speeches at “anti-imperialist” rallies. More exercises were scheduled for Sunday. Opposition figure and former presidential candidate Henrique Capriles sent a tweet dismissing the weekend training program as an expensive farce. He said Maduro should focus instead on bringing down Venezuela’s high crime rate. Diplomatic tensions increased last month when a legislative superbody called the constituent assembly was elected at Maduro’s behest. It has the power to legislate, bypassing the opposition-controlled congress. Maduro says the new assembly is Venezuela’s only hope of restoring peace after months of deadly anti-government protests. Leaders of the fractious opposition coalition boycotted the July 30 election of the assembly, branding it an affront to democracy. They called for an early presidential election, which Maduro would likely lose as his popularity sinks along with an economy blighted by triple-digit inflation and food shortages. Trump’s threat of military action played into Maduro’s hands by supporting his oft-repeated assertion that the U.S. “empire” has been waging economic war on Venezuela and wants to invade the country to steal its vast oil reserves. The idea had been laughed off as absurd by opposition and U.S. officials before Trump said on Aug. 11 that “a military option is certainly something we could pursue” as a way of ending Venezuela’s crisis.